Somewhere on the Internet, as I write, somebody will be arguing about global warming – or rather, several somebodies, since disputes require multiple parties, and global warming is, as claimed by some, to be sufficiently contentious to have spawned ongoing vituperativeness. Many of the lines of reasoning will include references to the cyclic nature of Nature. Most of the data considered will be from measurements of “surface” temperatures – the temperature of the atmosphere near the land surface of the Earth, and the temperature of the oceans near the surface with the atmosphere. These are of course, the easiest things to measure, as this is the part of the Earth system that people inhabit, and all kinds of surface temperature records, of varying validity and accuracy, have been recorded for millenia. (b) An assumption that surface temperatures can be treated with the usual statistical toolbox of techniques – that surface temperatures would, unless forced, fall into a distribution curve of random readings, spread like a bell curve around a central mean. And so an army of inspectors applies probabilistic statistical methods to the Earth’s surface temperature data sets, and some say it comes up with more questions than answers. For example, there may, or may not be, evidence that trends can only be claimed over decadal, or multi-decadal, periods; that all the apparent warming can be put down to natural cycles of the oceans, so a cooling phase will be next; that no trend can be claimed in 50 years because of the wild swings in the data ; that all the data is confused with volcanic episodes; that lots of mini-cycles in the Earth system are confusing us. And so on. When I find people arguing about the surface temperature records, and whether a global warming trend can be picked out from them, I ask them if they’ve looked at the bigger picture : the global heat transport system. Water can retain heat better than air – a very large proportion of the heating caused by sunlight ends up in the oceans – at different places in the depths of the oceans. 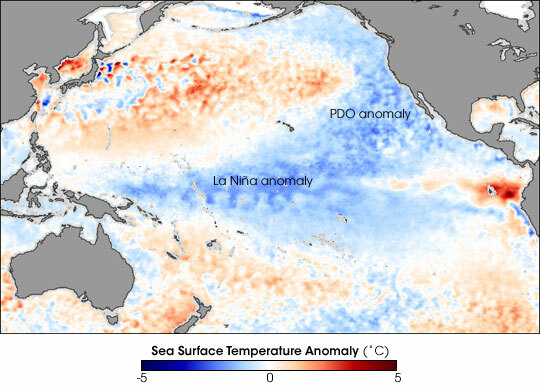 Over time, this heat is exchanged with the atmosphere, rather like global Gas Central Heating, but a lot of it stays down there – so if there is a trend for global warming, it’s probably best to look in the oceans for it. Anybody who is still arguing about the periodicity of surface temperatures, as if natural cycles could explain global warming, should think again. Surface temperature cycles are perhaps able to explain whether the next 10 years or so will see more or less global warming – but they cannot explain away the 100 year trend in global warming. And when people have come to terms that statistics cannot wipe away the reality of global warming, then comes the sting in the tail. Because the ocean is exchanging heat with the atmosphere over time, this creates a time lag – between the heat being generated in the oceans, and surface temperatures rising as a result. We ain’t seen nothing, yet. @joabbess @ClimateOfGavin Probably, but we only have good enough sub-surface observations of past ~50 years or so. @joabbess @ClimateOfGavin Of course – deep ocean observations are very relevant, but not the only type of measurement that are useful!